Louie to the Rescue: The Big Dig by Maria I. Morgan is a bright picture book that will appeal to young fans of Bob the Builder. Louie the Lawnmower and his gang of garden tools are very excited about a neighborhood contest for the best looking yard. After the man and the lady (they have no other names) use the tools to spiff up their yard, the man drives up in his truck loaded with big bushes and a large silver shovel! Unfortunately, Sherri Shovel does not make a good first impression and she makes fun of little Terri Trowel for being so small. In the end, Sherri learns her lesson, the yard is planted, and the contest is over. Every page is a full color illustration by Sherrie Molitor. Louie to the Rescue: The Big Dig is part of the Louie the Lawnmower series. The characters are simple but lovable and the overall theme is about friendship. Molitor’s illustrations alone would make this book. Her cartoon style is bright and colorful and the pictures are very appealing. Following the story is Louie’s Lesson Corner, which is a set of nine questions for discussion. Some of these questions include a challenge to go “Digging Deeper” by looking up Bible verses that relate to the questions. 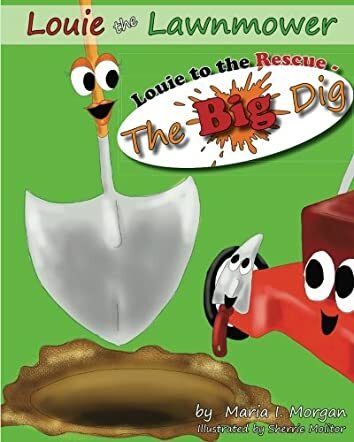 Louie’s Lesson Corner would work really well in a Sunday school class and, in fact, Louie to the Rescue: The Big Dig with the accompanying questions could be used as the whole Sunday school lesson. Nicely done.